Pakistan coach Hasan Sardar triggered a controversy by claiming that India backed out of the summit clash on a soggy pitch even though his side wanted to play. They lifted the Asian Champions Trophy jointly but India and Pakistan were Wednesday locked in a war of words over how the decision was reached to abandon the final after a thunderstorm and heavy showers in Muscat. The two teams jointly took the trophy on Sunday night and on Wednesday Pakistan coach Hasan Sardar triggered a controversy by claiming that India backed out of the summit clash on a soggy pitch even though his side wanted to play. 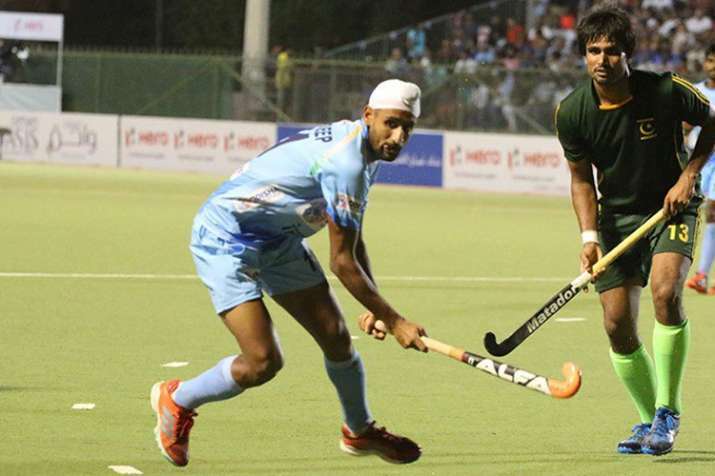 A Hockey India official rejected the claim, calling it a "blatant lie" and said Pakistan were the ones in a hurry to leave owing to an early morning return flight. "Our boys were pumped up for the final match. Even after the heavy rains we told the organisers we will play if they wanted the final to go ahead. But the Indians refused because of the conditions," Sardar said on Wednesday in Karachi. Hockey India rubbished the assertion. "It's a blatant lie. It was Pakistan who didn't want to play as they had a return flight at 3 am in the morning. Our flight was next day so we had no problem in waiting," the HI official told PTI on condition of anonymity. "By the time rain stopped, it was already 10.30 pm local time and if match was to start, it would have taken at least two more hours to prepare the pitch. The pitch was completely flooded, even the Tournament Director, broadcasters and commentators rooms were flooded," he added.